TD Toronto Jazz Festival Announces Headliners Including Diana Ross, Norah Jones, Cécile McLorin Salvant, Tower of Power and more! TORONTO – An all-star cast of musicians will headline the TD Toronto Jazz Festival, June 21 – June 30, 2019. One of music’s most iconic singers, Diana Ross, will perform, as well as multi-GRAMMY winner, singer-songwriter Norah Jones, Cuba’s grand dame Omara Portuondo, heavy hitters Tower of Power, jazz darlings Cécile McLorin Salvant and Emilie-Claire Barlow, and an exciting double bill with Rinsethealgorithm and Ghost-Note! Tickets are on sale now at www.torontojazz.com. The Sony Centre transforms when two of music’s most recognizable voices take centre stage this June. As one of the most successful recording artists and entertainers of all time, the Queen of Motown’s influence is still as pervasive as the early days when she led The Supremes. Fresh off the heels of her 75th birthday celebrations at the GRAMMY’s earlier this month, the legendary Diana Ross performs Monday, June 24. On Wednesday, June 26, nine-time GRAMMY Award winner Norah Jones takes the stage. She first burst onto the scene in 2002 with the release of Come Away With Me. Selling over 47 million albums worldwide, Jones proves why she’s this era’s quintessential American artist, weaving together country, folk, rock, soul and jazz. The TD Toronto Jazz Festival shines the spotlight on three outstanding vocalists, each impeccable in their own right. Canadian vocal powerhouse Emilie-Claire Barlow takes the Koerner Hall stage on Tuesday, June 25 with her affectionate treatment of both classic pop and jazz songs whole the next night sees one of Cuba’s greatest treasures on her final farewell tour. Best known for her work with the historic Buena Vista Social Club™, Omara Portuondo caps off a career that has spanned seven decades with One Last Kiss on Wednesday, June 26. Cécile McLorin Salvant returns to the Festival on Thursday, June 27 in an intimate duo setting with acclaimed pianist Sullivan Fortner, recreating some of that magic that won this year’s GRAMMY for Best Jazz Vocal Album. Carrying on the legacy of legends such as Ella Fitzgerald, Billie Holiday and Sarah Vaughan, she is unique in the breadth and depth of her repertoire among her peers. One of the most dynamic bands in soul music, Tower of Power celebrates its 50th anniversary this year at The Danforth Music Hall on Tuesday, June 25. Driven by powerful horns and tight bass lines, their distinct brand of music is relentless and a party like no other. The Horseshoe Tavern will host a special double bill performance on Wednesday, June 26 featuring local electric bassist Rich Brown’s Rinsethealgorithm and a new project from Snarky Puppy’s percussion duo Robert “Sput” Searight and Nate Werth which pushes the boundaries of jazz. Ghost-Note, which also features former Prince bassist MonoNeon, takes listeners on a mind-blowing journey – from James Brown to J Dilla, the Beastie Boys to Brazilian samba grooves, this is a celebration of music in all its forms. The TD Toronto Jazz Festival will announce in May its star-studded opening weekend celebrations. In a nod to Yorkville’s rich history presenting some of the world’s most important folk, pop and jazz musicians, the Festival will feature a legendary band in an unbelievable new opening weekend setting right here in the heart of the city as the TD Toronto Jazz Festival further expands throughout its home in Bloor-Yorkville. 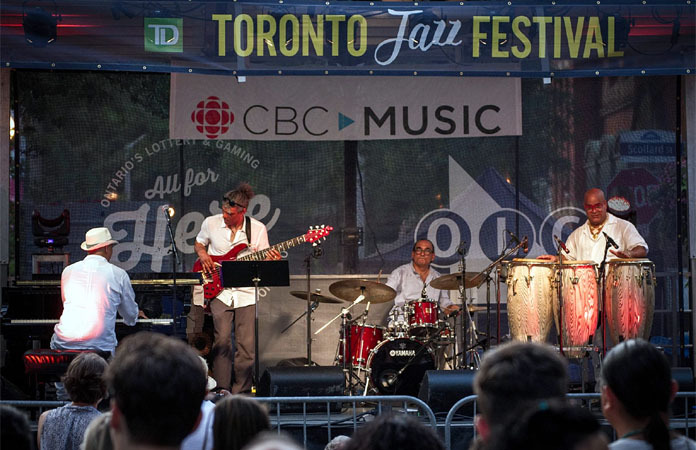 The TD Toronto Jazz Festival has grown significantly over the years and the 33rd edition promises to be the biggest yet with 175 free performances! Emilie-Claire Barlow – Koerner Hall | 8 p.m.
Norah Jones – Sony Centre | 8 p.m.
From the Buena Vista Social Club™ Omara Portuondo – One Last Kiss Tour – Koerner Hall | 8 p.m.
Cécile McLorin Salvant and Sullivan Fortner – Koerner Hall | 8 p.m.
Now in its 33rd year as one of the premiere jazz festivals in North America, the TD Toronto Jazz Festival runs this summer from June 21 – June 30, 2019. From concert halls to the streets of Yorkville, explore all the Festival has to offer for 10 jazz-packed days as we showcase the very best in jazz from Toronto, across the country and around the world!